Over the last several years, research from the CGIAR Research Program on Agriculture for Nutrition and Health (A4NH), carried out by the International Institute of Tropical Agriculture (IITA), the International Livestock Research Institute (ILRI), and the International Food Policy Research Institute (IFPRI), has sought to mitigate aflatoxins, and draw more attention to viable solutions. Build a sustainable market for Aflasafe. 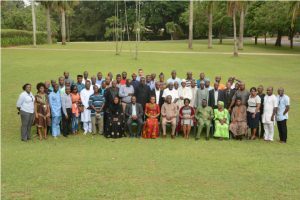 In April, implementers gathered in Ibadan for the project’s fifth annual induction and training session, to review successes and challenges to date as they consider how to improve the program moving forward. More than 30 attendees from across the maize value chain came together to gain skills in agribusiness and knowledge on best approaches to prevent aflatoxins and enhance food security and safety. Successful support of market-driven agriculture through private sector engagement in aggregating and marketing 129,896 tons of maize – more than 60 percent of the total production (216,493 tons), while 21 percent was retained for other purposes, including household consumption. The project is in its last phase, scheduled to end in September 2019. Private sector partners are putting together a strategy to then take over the innovative approach and continue progress begun under the project. To begin this work, an association has been formed to drive efforts in working with the new private company licensed to manufacture and distribute Aflasafe, and engage in policy advocacy on aflatoxin in Nigeria. AgResults is a multi-donor, multi-lateral initiative incentivizing and rewarding high-impact agricultural innovation that promotes global food security, health, and nutrition through the design and implementation of pull mechanism pilots. It is funded by the governments of Australia, Canada, the United Kingdom, and the United States, in partnership with the Bill & Melinda Gates Foundation, through a Financial Intermediary Fund operated by the World Bank.